The shift towards the localisation of social security means that certain benefits are no longer just a matter for DWP. 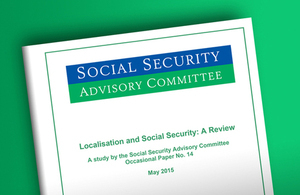 The Social Security Advisory Committee (SSAC) therefore calls for all relevant government departments, together with devolved administrations where appropriate, to take a joint interest in the future development of localisation and to forge a stronger relationship in co-ordinating the agenda. The committee considers that a cross departmental approach is essential to avoid inequality in standards and outcomes and to ensure that particularly vulnerable groups are not adversely impacted if vital support becomes more difficult to access. In a time of change it is important that a sharp focus is retained on the circumstances and needs of social security claimants and their families. We call for continued Department for Work and Pensions (DWP) leadership, working by invitation and in concert with representatives from across Whitehall, devolved administrations, local authorities and third sector organisations to ensure that necessary and inclusive standards of coverage and adequacy are maintained. The ‘localisation agenda’ has much to offer by way of flexing policy and delivery mechanisms to local circumstances. But these innovations, while conscious of the need for financial prudence, must be appropriately resourced and sustained into the future. The Social Security Advisory Committee is an independent advisory body of the Department for Work and Pensions. The committee’s role is to give advice on social security issues, scrutinise and report on social security regulations (including tax credits) and to consider and advise on any matters referred to it by the Secretary of State for Work and Pensions or the Northern Ireland Department for Social Development. The committee’s Chair is Paul Gray. Its membership comprises: John Andrews, Rachael Badger, Adele Baumgardt, John Ditch, Colin Godbold, Chris Goulden, Jim McCormick, Gráinne McKeever, Matthew Oakley, Seyi Obakin, Judith Paterson and Nicola Smith. For more information, contact Denise Whitehead, Committee Secretary.